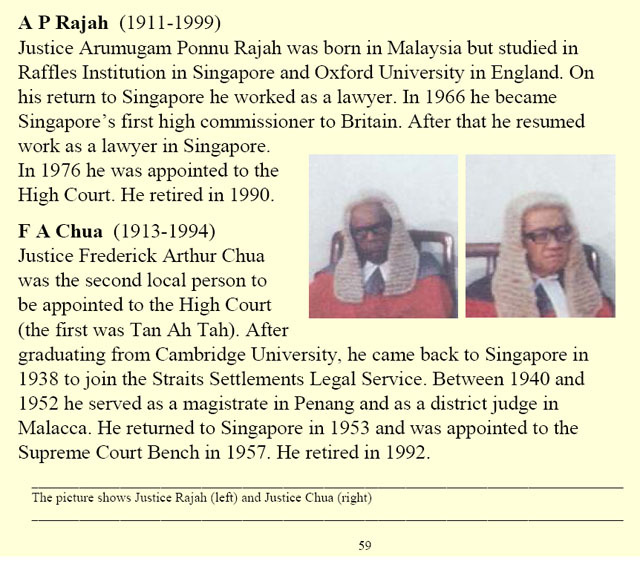 Justice Arumugam Ponnu Rajah was born in Malaysia but studied in Raffles Institution in Singapore and Oxford University in England. On his return to Singapore he worked as a lawyer. In 1966 he became Singapore’s first high commissioner to Britain. After that he resumed work as a lawyer in Singapore. In 1976 he was appointed to the High Court. He retired in 1990. Justice Frederick Arthur Chua was the second local person to be appointed to the High Court (the first was Tan Ah Tah). After graduating from Cambridge University, he came back to Singapore in 1938 to join the Straits Settlements Legal Service. Between 1940 and 1952 he served as a magistrate in Penang and as a district judge in Malacca. He returned to Singapore in 1953 and was appointed to the Supreme Court Bench in 1957. He retired in 1992.